Play video Do you think Leicester will win the title? from BBC SportDo you think Leicester will win the title? Play video Will Garde be sacked this week? from BBC SportWill Garde be sacked this week? We're off. Thanks to those who voted in our try of the Six Nations poll and cheers for your worst ever performance suggestions. But there's plenty of keep you interested and entertained. Our esteemed cricket team can guide you through the closing stages of Australia against Bangladesh in the World T20, with in-play highlights here. (Hint: the Aussies are going well). And with the issue of equal pay dominating the tennis agenda, our chief sports writer Tom Fordyce has looked into prize money disparity in tennis and other sports. From us, though, that's your lot. See you soon. Ladies and gentlemen, here is your winner. A whopping 32% of you voted this from Scotland's Stuart Hogg as the best try of the 2016 Six Nations. Germany coach Joachim Low has thrown Wolfsburg forward Max Kruse out of his squad following two recent off-field incidents. Kruse lost a large amount of cash in a Berlin taxi in October, then was involved in an incident in a Berlin club while celebrating his 28th birthday on Saturday. In a statement from the German football federation, Low is quoted as saying that Kruse had repeatedly acted unprofessionally. Owner Randy Lerner has failed to find a buyer for the club after putting it on the market more than two years ago. "The club must be more difficult to sell now for any decent sum than it was a year ago," said Bernstein. "I believe he (Lerner) is obviously devastated the club is where it is but he should be given great credit for a lot of terrific work he's done over the years." Voting is closed on our best try of the Six Nations poll. Another Monday, another exquisite blog from Manchester United's Juan Mata to revel in. This week the diminutive midfielder is full of praise for Marcus Rashford after his winner in the Manchester derby but also - fittingly for a man who ends his posts with 'Hugs' - urges caution. "Marcus showed again that he is a great player in the making," wrote Mata. "We all believe in him although we must remember that he’s still very young and he’s just arrived in the first team." Off to catch some rays... and train! While we await some proper sunshine in the UK, Liverpool's players are jetting off to Tenerife for a warm-weather training camp. It's just for those not on international duty, and the Liverpool Echo says those heading for warmer climes are expected to include Jon Flanagan, Kolo Toure, Steven Caulker, Tiago Ilori, Jose Enrique, Joao Carlos Teixeira, Cameron Brannagan, Jordan Rossiter and Kevin Stewart, as well as a number of Academy youngsters. Manchester City have defended charging a top price of £60 for regular tickets for their Champions League quarter-final against Paris St-Germain. A club statement read: "Pricing for each match is reviewed on an individual basis, based on factors such as the opposition and stage of competition. "As this match is the quarter-final of Europe's biggest cup competition and the first time the club has progressed to this stage, we believe the ticket prices are a fair reflection of the profile of the game." How much does your club charge? Find out in BBC Sport's Price of Football calculator. Aled Goddard: Has anyone mentioned Mauro Bergamasco's brief unsuccessful foray into being a scrum half? Liam Bradford: Sol Campbell for Notts County. Played one game, then left. Dom Breslin: Antolin Alcaraz for Everton has to be contender, especially in the Europa League 2nd Leg vs Dynamo Kiev. Horror show. Hopefully you make MOTD Kickabout's Spot the Ball a weekly destination now. If you haven't done it before... you're missing out. Head over here to get stuck in. Amid the influx of foreign talent into the Premier League, British footballers have rarely travelled well themselves in recent years. Gareth Bale is perhaps helping to buck that trend, after becoming the leading British goalscorer in La Liga history. And BBC Sport looks at the other Brits to enjoy success abroad. You've got 30 minutes left to vote for your favourite try of the Six Nations. Video caption: The top tries of the 2016 Six Nations, but which is best?The top tries of the 2016 Six Nations, but which is best? Fans threw flares and ripped up parts of the Mohammed V stadium after Raja's 2-1 victory over Chabab Rif Al Hoceima. The country's DGSN security service said in a statement that 31 people were arrested for "acts of vandalism". Footage on Moroccan media showed the fans, dressed in the club's green colours, charging at each other. It was unclear how the clashes had erupted. 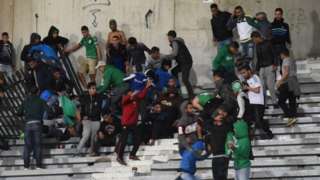 Two people were killed in fighting among fans of Raja de Casablanca on Saturday, the Moroccan Football Federation (FMRFF) confirms. With Joe Hart reacquainting himself with the physio's room at Manchester City, it could present an opportunity to stand-in keeper Willy Caballero. And the man who was City's hero in their League Cup final penalty shootout victory over Liverpool says he is ready. “When I came here, I knew my situation, but I came to play, and if I get my opportunity I try to take it and do my best,” he said. “I had opportunities in the cup, and have been training really well, so I am ready. “I spoke to Joe and he told me what he felt on the pitch, but now we have to wait for the diagnosis and maybe on Monday or Tuesday we will get the result of the scan. “I hope he recovers soon because we need him in this team as he is our first keeper." Bangladesh have amassed 156-5 in their World T20 clash against Australia, with Mahmudullah cracking 49 from 29 balls late on. Adam Zampa was the pick of the Aussie bowlers as he took 3-23 off his four overs. So Australia need 157 to keep their hopes of qualifying for the semi-finals alive. You can follow their run chase and watch in-play highlights on our live text here. Our colleagues at Magazine have produced an inspiring video on Triinh Thi Bich Nhu, a Paralympian swimmer from Vietnam who has overcome her disability and a fear to wearing a swimsuit to compete in international sport. To watch the video, head here. What could be better than a Grand Slam win on a special night in Paris? A Grand Slam win in Paris set to the dulcet tones of Billy Vunipola perhaps. The England number eight unleashes his inner pop idol with a rendition of the Backstreet Boys classic 'I Want It That Way' in the dressing room following his side's 31-21 victory over France. Want to watch? Of course you do - the behind-the-scenes footage is here. This, everyone, is just sensational. A love letter to the goal - by Italy goalkeeper Gianluigi Buffon. Kevin Roome: Poor Scott Boswell in the C&G Trophy final at Lord's in 2001 when he got the yips in 'the worst over ever'. Carl Arrowsmith: Worst ever performance? Probably the whole Aston Villa team this season. Derek Elmore: Maicon vs Gareth Bale at White Hart Lane in Spurs' only Champions League season.